Situated at the foot of the spectacular mountains, the Five Sisters of Kintail, Shiel Bridge Caravan Park is often people's first stop in Lochalsh. The campsite has undergone recent upgrades to enhance the quality of the services including a facility block offering hot water 24/7, toilets, a disabled toilet and showers, also an area for dish and hand washing . 3 acre site on Staffin Road heading north from Portree. This site is a pleasant 15 min walk from Portree which is the main town on Skye. The site is on a hill with great views. 2 toilet blocks which have disabled facilities. The Weblink above gives access to Torvaig Campsite website. 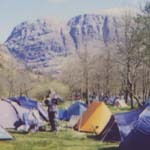 Sheltered campsite approx 3 miles north of Arisaig. Located on farm. Ordnance Survey Sheet 40 Grid Ref 662,915. Great beaches at the foot of the site accessed by walkway. Pitches are mainly grass, located within two seperate camping areas and with modern heated facilities. See weblink for further info. Displayed picture used by permission. 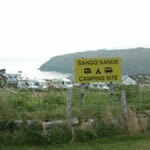 Camping pitches in area fenced off from stock with stunning views overlooking Isle Rum and Atlantic Ocean. Compost toilet, fresh drinking water and sink for washing. Showers available in house. Situated at northern end of isle. Please contact Sue when planning to visit or when intending to camp out of main season. Located off the main road between Inverness and Dingwall. This woodland site with a riverside location has recently been upgraded and extended with new facilities. Tourers and tents are welcome at the newly refurbished 4 star Beauly Holiday Park. Calor gas available to purchase. The onsite lounge bar is fully licenced. See weblink for full details. 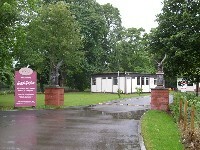 This site was upgraded for the 2005 season with new toilet and shower blocks. It is a large open site located on the shore of Loch Morlich. 7 miles from Aviemore on the road to the Cairngorm Ski Centre. 220 touring pitches with electric hookups and ample room for tents but book ahead in high season. Great location for all outdoor pursuits. Small outdoor shop and cafe next to site. Contact site re disabled facilities. Located on small peninsula three miles north of Ullapool. Ideal location for water sports, fishing and walking. Right on waterfront. The site also offers a static home to rent alongside camping and touring facilities. Located central to village and looks out Northwards to open sea. Sheltered indoor campers kitchen and free showers. After October there is no hot water but the toilet blocks are open - please contact site prior to planning off season stay. On the hillside with great views across the loch to the Attadale Hills. Sheltered by trees and pitches layed out on level terraces. Hot showers, toilets, washing machine, electrical hookups. Beautiful views, sheltered, basic. Quiet rural position, but within a few minutes' walk of village amenities. Contact Mrs Joanna Boldra. This site has now been re opened as Pitgrudy Holiday Park and again offers pitches for tourers and tents. Further fuller information from the new site owners is available via the weblink. Lovely views of the Dornoch Firth. 1 mile from Dornoch.